What exactly is Private cloud storage and why is it important? Private cloud storage is simply storage that keeps an organizations data at an in-house storage array. You might be wondering what the difference is between Private Cloud Storage and Public Cloud Storage, and the truth is there are many similarities and differences between the two. Private cloud storage, also known as internal or enterprise cloud, is located on the organization’s data center or intranet. Here, all of the data is protected by an Internal security processes. This is why private cloud storage is beneficial because it offers a higher level of security and enables the organization to have more control over the environment. On the other hand, with Public Cloud Storage you do not have as high of a security value because you are not responsible for maintaining your own storage arrays. Public Cloud Storage is conducted by using an outside provider to manage your storage in their data center. So what is the best option for your storage environment? This depends on how concerned you are with security and privacy. If you are concerned about your data and want the safest outlet private cloud storage is the best way to go. If you have chosen to take complete control of your storage environment implementing private cloud storage to manage your data, then the next step is to find the best data storage solution and capacity planning for your array. What is a data storage solution? Data Storage solutions usually take two forms: general and specific. General purpose data storage solutions contain features to accommodate a wide variety of workload environments but are not custom built for one or two workloads. Solutions which fit this model include EMC VMAX, NetApp, IBM V7000, and most private cloud storage solutions. Utilize Storage Capacity Planning best practices to find the Best Data Storage Solution. Storage capacity planning helps to determine the best data storage solution for your environment. This is because data storage solutions offer little insight on storage usage and free space. As such, storage capacity planning helps forecast and assess current and future storage needs. Hence, storage capacity planning is important because it gives insight on storage, configuration, utilization and performance characteristics. Without storage capacity planning one has no idea on storage used, which ends up costing companies time and money. Storage capacity planning involves three steps. Step 1. Regular data capture. 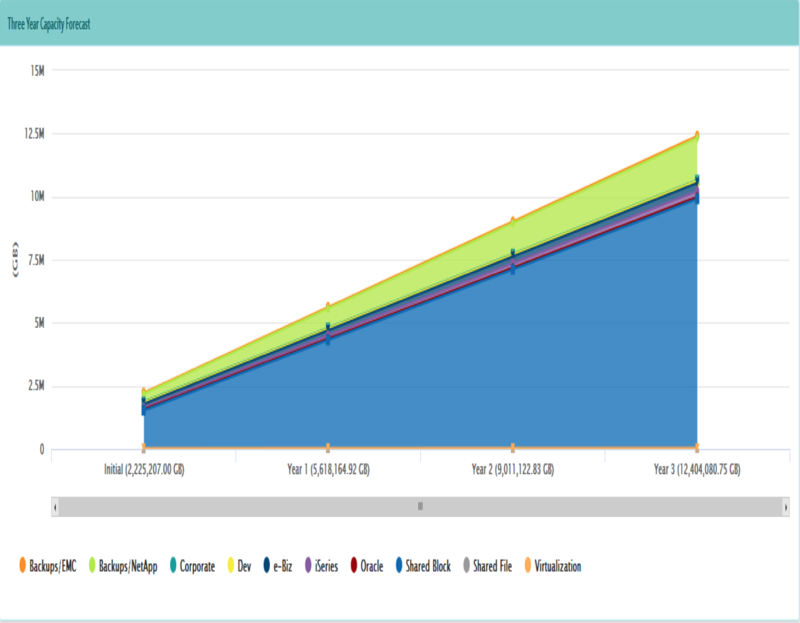 Automatic, regular storage capacity planning is necessary to generate historical trends. Step 2. Workload analysis and organization must be conducted. During this step, storage data is broken down by specific workloads. These could include workload categories, applications, functional departments, or IT environments (e.g. production vs. test vs. development). Step 3. Determine future predications by workload. This includes both performance and capacity historical trends, as well as additional future requirements. Most users utilize spreadsheets for their storage capacity planning process because the tool is flexible and low cost. The problem with using spreadsheets is that all the steps in the process are manual. Therefore, requiring human intervention and management making the process difficult to repeat and exposed to human error. Visual Storage Intelligence® provides the same benefits as spreadsheets while automating all of the steps outlined in the process. Visual Storage Intelligence ® is a database application which provides a spreadsheet export function so users can customize if needed but also get complete automation of the data collection and analysis process needed for the storage capacity planning process.